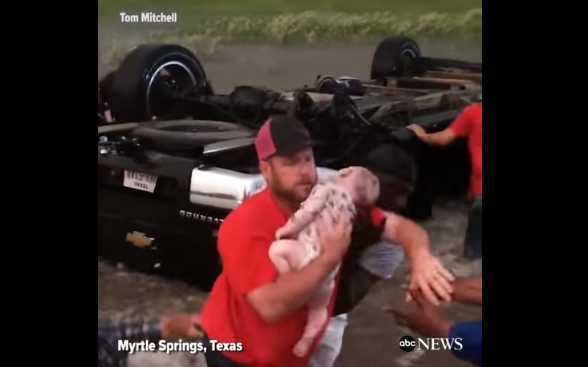 CANTON, Texas — Several strangers being described as good Samaritans helped to rescue and resuscitate two babies that were trapped in a truck flipped over in Texas floodwaters on Saturday. The incident occurred as tornadoes and inclement weather struck East Texas, killing four. Phillip Ocheltree was on the road at the time with his wife Emily, as well as their children Marshall, 4 months, and Addyson, 18 months. They were trying to find a storm shelter when their truck was pushed off the road and flipped over in a ditch filled with four feet of rushing water. As the couple hurriedly worked to free their children from the vehicle, but to no avail, others pulled over to rescue the family trapped inside. Virginia Howard says she was the first on the scene, and believes that God put her in the right place at the right time. Howard soon saw the Ocheltree’s truck overturned in the flooded ditch, and stopped to help. She immediately called 911. Several others quickly pulled over as well, including Korry Prox, Tom Mitchell and Jaime Martinez, a former firefighter. “I just told them to get my babies; I’ll find a way out,” Emily Ocheltree recalled. The water was rushing so forcefully that it was difficult to open the doors, but rescuers were finally able to pry them and free the infant and toddler. Marshall was the first to be removed. Mitchell began performing CPR on the child, who was limp and turning a blue-grey. Within moments, Marshall began breathing. “The first prayer she said, I felt a response in that child,” Mitchell told local television station WFAA. Soon, baby Addyson was also free, and she likewise needed CPR. Mitchell called out to God as well as he worked on the child. Finally, Addyson began breathing, although with difficulty. “There she goes!” Howard declared as the rescuers clapped. The children were transported to the Children’s Medical Center of Dallas, where Addyson remains in stable condition, but is breathing on her own. Marshall has been released. On Monday, several of the rescuers were able to reunite and remember that extraordinary moment. “When you came over and started praying, at that moment it gave me strength to continue and that infant responded right then,” Mitchell told Howard. The Ocheltrees have met at least one of the rescuers so far. “You did such a good job in saving my babies,” Emily Ocheltree tearfully told Jaime Martinez, hugging his neck with gratitude. The full footage of the rescue may be viewed here.